This stunning bouquet brings together the best of old world charm with Calla Lilies and oriental mystic from exotic Asian tiny spotted Orchids brings. This is the perfect gift for anyone who can appreciates this overload of beauty. Our bouquets do not include a vase. However, for a lasting impression, we recommend a Premium vase to complement Tiger. 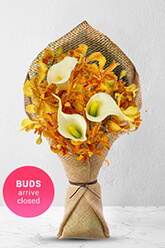 Competitively priced, stunning bouquet of lilies and orchids. easy and quick online service. Certainly very easy to order.....appreciated the reminder! From what I understand, the flowers were delivered to the right address, right person, right day....what more can one ask!